This past week, we visited the Chrystler Museum of Art in Norfolk, VA. 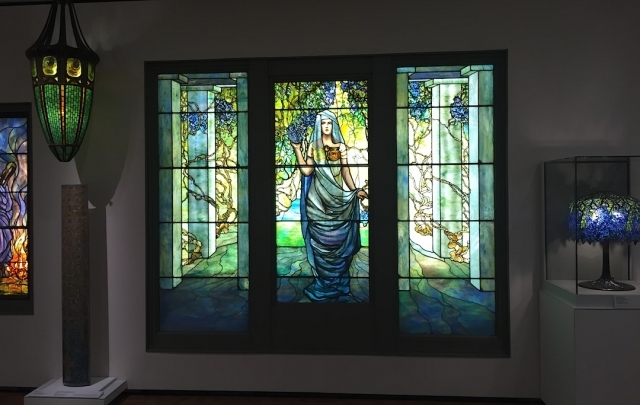 The museum has a lovely collection of works by Tiffany Studios. The museum lists 177 works by Tiffany, and most are on display. The majority of items by Tiffany Studios were donated by Walter Chrystler Jr., a longtime collector of paintings and decorative arts. The galleries included the full spectrum of work created by Tiffany Studios, including lamps and several stunning windows. Also on display were many pieces of exceptional blown glass, metalwork, and architectural mosaic fragments. 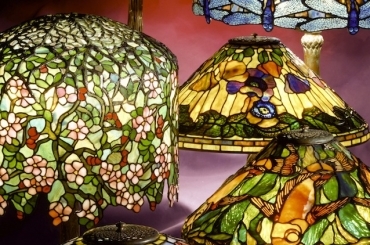 Mr. Chrystler had a leaning towards Tiffany lamps that feature exceptional blue glass. Included in the display are an 18″ Wisteria, 18″ Flowering Lotus, and a stunning 22″ Dragonfly.